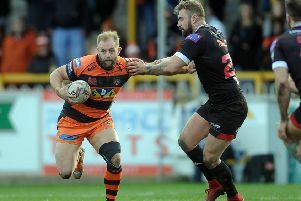 Ash Robson in action for Castleford Tigers. Castleford Tigers have confirmed the release of young outside back Ash Robson, who has joined hometown club York City Knights. The 21-year-old full-back or winger made two Super League appearances in 2015, but missed the entire 2016 campaign after sustaining a serious knee injury in a pre-season game at Bradford. He has recovered now, but asked to be released from his Tigers contract and has now signed for York for an undisclosed fee. Tigers chief executive Steve Gill said: “After discussions between ourselves, York City Knights and Ashley Robson a decision was made to facilitate Ashley with a move to the Knights.